Largehearted Boy: Book Notes - Claire Fuller "Our Endless Numbered Days"
Book Notes - Claire Fuller "Our Endless Numbered Days"
Claire Fuller's novel Our Endless Numbered Days is an auspicious debut, an unforgettable psychological thriller with one of the most haunting unreliable narrators I have ever encountered. "Like Emma Donoghue's Room, Fuller's thoroughly immersive debut takes child kidnapping to a whole new level of disturbing. . . .Fuller alternates Peggy's time in the forest with chapters that take place [nine years later] in 1985 after she reunites with her mother—building an ever-present sense of foreboding and allowing readers to piece together well-placed clues." 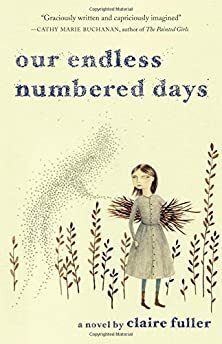 I wrote Our Endless Numbered Days with Iron and Wine's music playing on a loop – every song. It would have been nice, but self-indulgent, to list only his music, so instead here is a possible sound track or playlist. I'm a sucker for songs with a story, and "Jesus the Mexican Boy" is a story about a man who falls in love with his best friend's sister and runs away with her. I've seen Sam Beam (Iron and Wine) a couple of times. The first was at The End of The Road Festival when I persuaded my husband to shout the name of this song in the hope that Sam would play it. But he only cupped his ear with his hand and shouted back, 'What was that? Beard?' The second time I saw him play was more recently in London where Sam encouraged the audience to call out song names, and although I wanted him to play his song "Die," I didn't think it was an appropriate word to shout at Sam Beam in front of an audience of fans. He did however play "Jesus the Mexican Boy" without me even asking. Another piece of music with a story. After I split up with my first husband I had a brief relationship with a man called Gillan. He would borrow CDs from his local library based on their covers and one he liked the look of was Blue Horse by The Be Good Tanyas. I was quickly taken by all of their music and now my nineteen-year-old son plays this song on his guitar and my eighteen-year-old daughter sings along. When Gillan and I split up I was devastated beyond all proportion – still grieving I think for my lost marriage. I would lie in bed listening to Julie Blue, the Joe Purdy album that this track comes from. I love the sound of the water as a back-drop to the music. I listened to it until my children (then aged nine and ten) said they were sick of it, and I finally got up and became normal again. 'You need some love and understanding, Not that dinner like you're planning'. Before Tim moved in with me about five years ago, we used to do what we called 'art projects'. One of these was to write notes to each other and hide them in the other's houses. When Tim packed up his belongings he found all the notes I had written to him, some of which were lyrics from this Woodpigeon song. I have yet to find two of Tim's notes to me, hidden somewhere in the house we now share. This piece of piano music is played many times by Peggy, the main protagonist in Our Endless Numbered Days. I can't play the piano, but I needed a short and beautiful piece which is supposed to be difficult to learn. "La Campanella" means the little bell, but Peggy 'sees' the music as a bird trying to escape from a cat. I listened to it over and over while I was writing the musical sections. It was hard to pick a single Sufjan Stevens track, there are so many I love. But this one has banjos, a story, mystery lyrics, laughing and a French horn that comes in at one minute twenty seconds. What's not to love? Plus, my daughter and I sometimes sing this (very badly) when out walking in the woods. I first heard Neil play in a tiny upstairs room at The Railway pub in Winchester, England. The room was jammed with chairs, right up against the stage, which was just a low platform. Tim and I got front row seats so we were sitting only about two feet away from Neil, which much have been pretty weird for him with all these faces staring at him. It was a practice gig before the start of a tour and he wasn't working to a playlist, so he asked the audience what we'd like him to play. And I said 'Spin the Bottle please.' I didn't have to shout, I could have whispered and he would have heard. Anyway, he played it, and it felt like he was playing it for me. My son is a fantastic acoustic guitarist and singer, but too shy to play in public. I often give him lifts to and from his father's house, and the payment I demand is for him to play me songs in the privacy of my sitting room. "Lakes of Canada" is one of my favourite. Sometimes he plays for me instead of giving me Christmas or birthday presents. I tell him he's a cheapskate, but secretly I'd much rather have him sing and play his guitar than receive any present he could ever buy me.